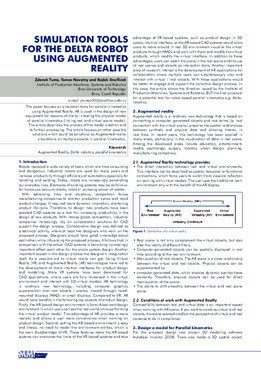 The paper focuses on simulation tools for parallel kinematics using Augmented Reality. AR is used in the design of new equipment for reasons of clarity in testing the physical model of parallel kinematics (linking real and virtual scene model). The article describes the process of the model creation and its further processing. The article focuses on other possible solutions which could be beneficial as Augmented reality simulations on multiple objects in parallel kinematics.